First thing: A tall glass of hot or cool lemon water, and two cups of coffee with NutPods creamer and a teaspoon of coconut oil. I usually wake up parched from the 8 hours of no water all night, and prefer a glass of fresh lemon water to wake me up and quench my thirst. I have to have my coffee on weekdays, so I add in my favorite creamer and add the coconut oil for a dose of healthy fats to curb my appetite first thing! Breakfast: A HUGE smoothie every. single. morning. I work out in the AM before breakfast, so I am usually quite peckish right after and need something to fill me up fast but also something portable while getting ready (because I'm always rushing)! I have two go-to flavors: fruity (mango/pinapple or mixed berry) and chocolate PB! My smoothie base is always spinach, full fat greek yogurt, water, spirulina powder, maca powder, chia seeds, protein powder, and ice. Here's an in-depth basic green smoothie recipe that's great for dessert! Snack: Popcorn topped with nutritional yeast. If you've never had nutritional yeast, it's SO YUMMY. I personally love the flavor of it and could probably eat it by the spoonful if I had enough water nearby LOL. I buy bags of already popped popcorn, but make sure you read the ingredients before you purchase. My favorite brand is by Harris Teeter and it's organic popcorn popped in coconut oil and Himalayan sea salt. That's it! Lunch: My usual lunch is a large salad. I love a salmon caesar on the rare occasions I eat lunch out, but what I typically make when I only have an hour to cook at home and eat is this: greens massaged in apple cider vinegar, tahini, lemon juice, and olive oil. Top with diced avocado, grape tomatoes, pitted Kalamata olives, and roasted chickpeas in paprika and salt and pepper for a crunch. I top with salt and pepper and nutritional yeast and it's SO yummy and filling! This time of the day I need protein and fats because if I don't have a proper lunch, my inner junk food obsession comes out and cannot be controlled. Snack: I need something sweet after lunch around 3-4PM or I will end up in the Chick-fil-a drive through ordering a large milkshake :( I go for a Lara bar because I can take them on the go and they do a good job of holding me over before dinner since they are full of REAL ingredients. Also, a fresh piece of fruit is perfect after lunch to curb the sweet tooth! Dinner: Fish is my favorite thing to have for dinner. Cod or wild salmon (here's just one of many articles on the difference between wild and farm raised salmon and why it matters) and cooked veggies is a perfect dinner for me. To be honest, dinner is my smallest meal of the day because I am starving in the mornings and afternoon, so by dinner I don't have much appetite. Some days I have 2 glasses of red wine and a huge bowl of popcorn with nutritional yeast for dinner. No shame. I'm basically Olivia Pope. I actually do have the exact wine glasses from her show since we're on the subject! Eating healthy should be fun and not too difficult. I keep my meals simple and love them that way, and I love the flexibility of having many different food options depending on what I feel like. 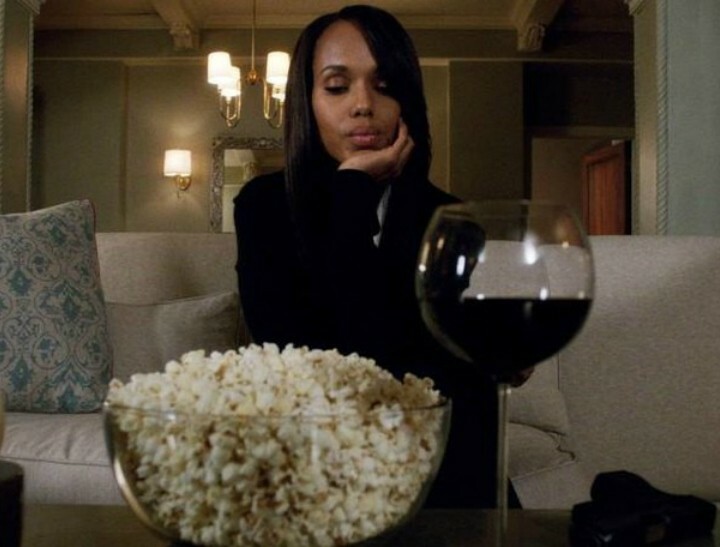 I love my wine and popcorn and if that's my dinner some nights then awesome. If I decide I want to treat myself to Kilwins and have a scoop in a waffle cone for dinner (I did that a few Sunday's ago) then great! I enjoy listening to my body and as long as 90% of the time I am eating as fresh and clean as I can, I certainly will never keep myself from enjoying a treat or a few pieces of pizza if I feel like it! And that, my friends, is how you make healthy eating EASY! Just eat as few ingredients per dish as possible with as many real ingredients as possible and that's it!